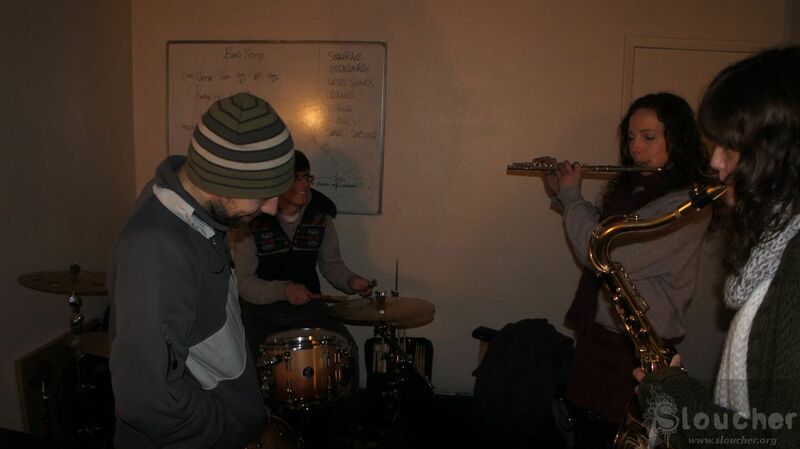 Picture this: a small cramped practise room in the heart of (well, near one of the football stadiums, dunno which team). 6 musicians, all from very different backgrounds. Not a single guitarist in sight (well, there’s one but he is not playing guitar) and a bass player that was AWOL, saving the world from the evil forces of Pitchfork and Robert Christgau. It’s the Legend of 7 Black Tentacles and a small discussion about one of them being called a “BFF” in a previous interview for this website rages on. I am reminded this is off the record. I think it’s a joke, but I then see a laser sight on my chest. So it goes. 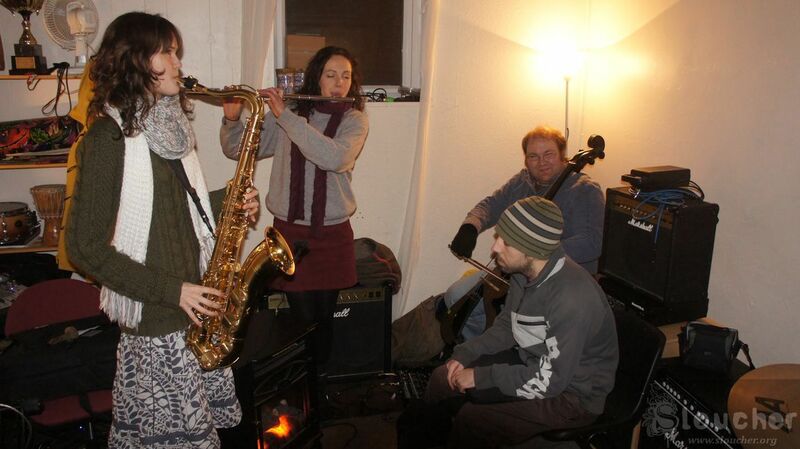 They are Ben (cello), Hannah (sax), Sarah (vocals/flute), Gordon (keys/samples/field recordings), Andrew (MC) and Tim (drums). You probably get this one from everyone, so here it goes: the name of the band came from? Ben : It’s originally from a film called Wave Twisters by DJ Qbert. Amazing animation, there’s no words in it, just scratches. There’s this evil worm that wants to take over the universe and his minions are the black tentacles and that’s where the idea came from. There’s a healthy rotation of band members, so what’s the history of the band? Andrew: It originally started with DJ Baron von Badd, also known as Zxodiac. 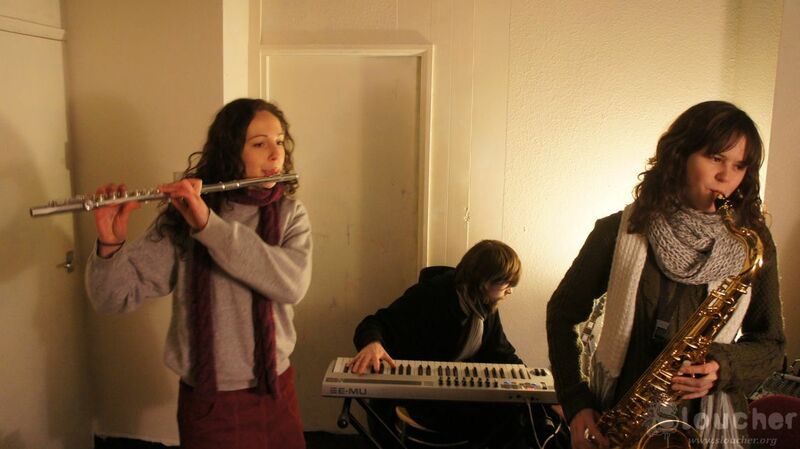 Basically, he was looking to pull a bunch of different musicians in the way that The Cinematic Orchestra came about. Some were session musicians, some stayed. Ben: I was doing classical music and got asked if I liked “interesting music”, I said yes and I was asked to join. It started up as Matt doing live DJ and then we got a bass player, a drummer and Vicki as a singer. Then Bo, a poet, then Chris playing violin, then we got Vex (Andrew’s MC persona is called V3xation). Andrew: We had a guy doing visuals for us and I used to drag a projector to live gigs, that was fun. Ben: I think there’s been 14 different people in the band over the years. Sarah: We have new faces and doing new stuff this year. Ben: We have loads of different instruments and I really like the line up we have right now. We are now 7 but I feel we’re quite focused. Andrew: Certainly easier to arrange gigs. In the way of writing songs, it’s easier to write with 7 people instead of eleven. We got a very wide arrange of music. Sarah plays flute, sings and plays guitar. Brew [Gordon’s nickname – Ed.] 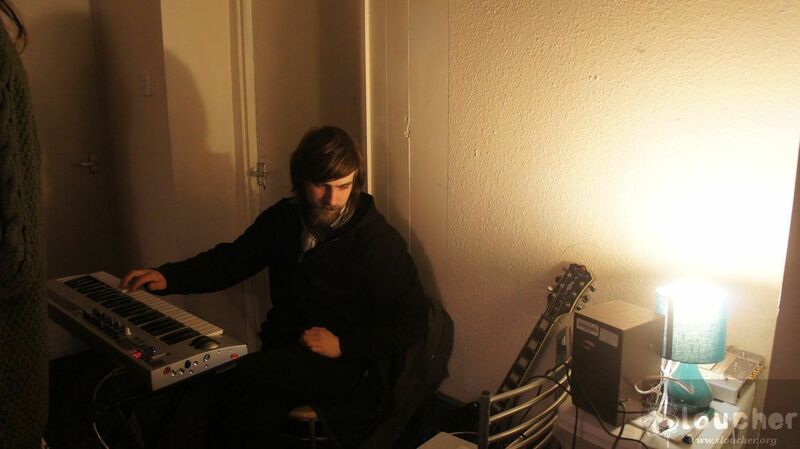 can do sequences live, keyboards, programming, lives samples, guitar and a surreal tape deck. So, interesting ideas with a wall of noise! Let’s do a twist on the usual “what’s your influence” question. What’s the major influence of the person sitting at your right hand side? Andrew: Definitely Portico Quartet. Bjork, some britpop for the 90s due to peer pressure from the people he was growing up with. Acoustic Ladyland. Ben: Hanna‘s influences? I know she likes a lot of jazz music, she played in the University of Sheffield‘s Jazz Orchestra. She also likes interesting electronic music like Mr. Scruff. Hanna: Gordon’s music taste…oh my God. Gordon: It’s true! I have several albums. Hanna: Portico Quartet is theme of the week. He’s done a remix of one of their songs. Gordon: Sarah‘s influences? Joni Mitchell. Leonard Cohen. Jeff Buckley? Tim: Andrew? I’ll say: any sort of localised band. I suppose the definite influence in the delivery of his lines is Zack de la Rocha, but I don’t wanna say that because if I do, then you’ll think the band is trying to be Rage Against the Machine and that’s not true. De la Soul too. Ben: We’re very democratic with our influences and on our song creating discipline too. Tim: You could put our influences in a Venn Diagram. They mention that Mr. Mercer is not present. He’s the bass player. He likes Bonobo, Lamb and Portico Quartet. Old school funk too. “He always gives us a good bass line”, says Ben. Last year you had Let’s Begin Now, vol. 1, so what’s the story with vol.2? Any new music? Sarah: We have been writing new stuff . Ben: We plan to record this year. We’re a couple of tracks away from being finished. Andrew: Let’s begin now was a sort of an anchorpoint on a time scale of where we were in 2009 and the changes in the band is giving us new experiences. The EP was a good time capsule of our ideas and now we have a general rolling theme with the lyrics and the sounds. Let’s begin now was a mish mash of ideas and genres. Ben: Yes. A hip hop tune. A jazz tune. A heavy tune. A post rocky tune. Andrew: Now we have all the elements that makes us distinctly us. Andrew: We evolved intellectually as a band, playing harder stuff. There’s not that many hip hop singers writing stuff in a 5/4 time signature, which interests me both as a writer and an emcee. There’s also the fact that everyone is chipping in during the song writing process. Ben: It’s taken a while, but, let’s face it: you can rush something out or wait until it’s properly ready and then launch it. We are ready to do it this year. We’re tighter and our music is better. If you keep quiet for a bit, people won’t judge that much from what you did before and it will sound more fresh. Andrew: Everything comes in cycles. 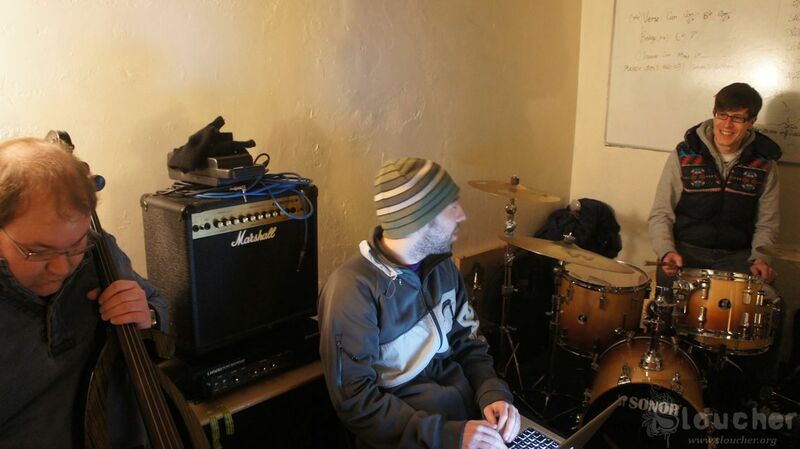 We haven’t been sitting around only, just reworking the songs, making them grow since 2009. We’ve played a lot of gigs and festivals and the experience has made us grow. Ben: We’re doing it at Sounds like Maldini‘s studio. Very DIY, we are using the best of Sheffield‘s talent. Tim: I live with him! Sarah: Ben‘s basically saying he likes to do it with his housemate. Should we talk about side projects? Tim: Sure! I’m with Screaming Maldini. Andrew: I make music with other people. Done. Ben: Me and Sarah do Captives on the Carousel. We’ll be recording soon. Got some tunes ready. I also do music with Woolly Mammoth and Joe Banfi. Hanna: I like jazz quartets, Tentacles is always a good chance. Jazz keeps influencing me. Gordon: I’m in Cobra-Fist. We’ve got a couple of new tracks that we want to record. I do my own electronics and a couple of remixes. I’m setting up a project with Laurie from Hey Sholay, using these bad boys (shows an analog tape record for field recording). Gordon: Yes, it will be ambient stuff. Ben: Can I mention the pub quiz I do at the Riverside every Monday? It’s intellectual (!). Sure, don’t ask Gordon about my answers from Not what you know quiz. Any plans for more gigs? Ben: We’re waiting for Tim to get better. He’s got tendonytis. We’ll do some stuff in the summer. We’ve learned the hard way that you can’t write songs and play gigs at the same time if we want to keep it democratic, so we chose writing. As Sarah has to leave the interview, we continue talking, dabbling into the touchy subject of politics. It was an interesting conversation and you’ll read it here next week. Posted in Home, Interview, Interviews, Unsung heroes of musicTagged Captives on the carousel, Cobra-fist, Experimental music, Home, Legend of 7 Black Tentacles, Screaming Maldini, Sheffield, The Machiavellian Mix o'Evil (TM)Bookmark the permalink.